We were finally able to sleep in. The weather the past few days has been dreary with grey skies and a cold drizzle of rain. We’re hoping for better weather when we go off for city sightseeing. While we waited for the kitchen team to arrive, Chef Paolo gave us an Italian culinary history. With cave paintings dating back many centuries, chef ensured we knew that the pasta wasn’t introduced by the travels of Marco Polo from East Asia. The culinary lesson continued as we moved into the kitchen of the restaurant. Chef Aldo taught us three main pasta sauces, all tomato based, and one very regional sauce while also tomato based, starts with a puree of sage. We anxiously watched chef make bolognese, pomorollo, pomodoro, and the regional sauce, which I captured as iona (but need to confirm with Chef Paolo). 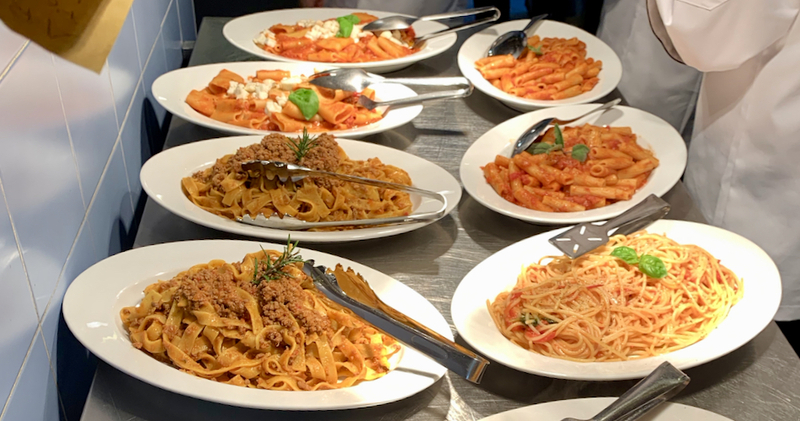 After a lesson on how to cook different shapes and sizes of pasta to have finish at the same time, we watched chef finish the dishes in saute in each of the giant pots of sauce, adding lots of grated parmesan cheese. His creations became our lunch for the day, with fresh bread and of course, wine. As we’d had a later start to the day, we took a brief siesta, before boarding the bus to drive about an hour away to the ancient city of Siena. Chef Paolo gave us walking tour of the city and showed us where the inspiration for our fried dough dessert comes from in the PIazza del Campo. We then had a bit of time to explore on our own before dinner. Upon reconnecting at the Piazzo del Campo, we made our way to dinner for another amazing meal. Chef ordered for us a variety of dishes that included truffles in a cheese soufflé, charcuterie of pecorino Tuscano. We then enjoyed a carpaccio with more truffles and parmigiana reggiano followed by a pasta course with wild boar ragu and tagliatelle noodles. Our dessert was a chocolate filled profiterole. Wine was of course from where we are staying. Sufficiently stuffed once more, we hiked back to the bus parking lot for the drive back to our villas. We have an early start tomorrow for our full day in Florence.